Knowledge is the key to success. For many, school was only an obstacle to overcome. But for those who see knowledge as a tool, going back to school is an opportunity to enrich and elevate themselves. The College of Real Estate offers numerous options for learning, catering to all students’ unique learning styles and schedules. Whether you prefer an in person learning experience or online courses, the College of Real Estate is the best place to master the skills and mechanics required to earn your California Bureau of Real Estate Salesperson License. Everyone has their own unique learning style; for those who are not always comfortable in groups or have a full time job, online learning is perfect. Enrolling in online courses provides the same education and materials while being delivered in a way that is more comfortable and workable for certain students. Students enrolled in online courses are able to master concepts in environments that best fit them, whether they prefer to be in a quieter environment and/or are more independent learners. 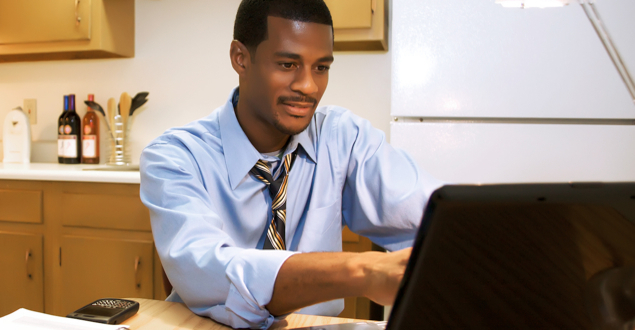 Receiving an online education allows students to learn at their own pace. Instead of having to keep up with the rest of their peers or being held back by, students that choose to take courses online are able to carefully review lessons that they are confused about or quickly brush up on concepts that they have already mastered. Everything is exactly at their own pace. Attending class can be challenging at times for those with busy schedules. There are all sorts of variables and situations that could cause someone to be late for class or not be able to attend at all. For people who do not have that much time available to them, online learning is ideal. Online students do not have to worry about transportation, accidentally oversleeping, purposefully oversleeping (as a result of semi-consciously hitting the “Snooze” button), having time to eat a proper meal, getting a ticket because of parking, or speeding, etc. Taking our online courses allows students to choose when and where they will learn the next topic. While in person class schedules are thought of in comparison as less flexible, they do provide a routine. Attending classes at regular times every week allows for organization and the focus that many students thrive with. Students know when their next class will be, how much outside of class tasks they have, and when they will need to study for tests and quizzes, planning their schedules accordingly. There will always be a set schedule for them to work with, taking away the burden of having to squeeze in lessons in between dentist appointments, grocery shopping, dog walking, doing laundry, meetings, etc. The College of Real Estate offers both online and in person courses so that everyone, even those with varying levels of time availability, can earn an education in real estate. For those that work the best in groups and/or learn the best in person, our in person sessions are perfect. The traditional avenue of teaching furnishes an energy and feeling that fosters schooling. Supported by a sense of camaraderie amongst their peers, students will be surrounded and encouraged by those around them, both staff and peers. Some individuals thrive off of the company of others, making an in person education perfect for them. No matter what type of learning style that you prefer, the College of Real Estate has opportunities for all to enrich themselves and learn to the best of their abilities. Both learning online and in person provides students with a plethora of resources. Although online students cannot interact with their peers as instantaneously as an in person student, they still have access to their instructors. Online students can still contact instructors, giving them access to a multitude of information and knowledge. Students who take online courses do not have to live in a specific area of California. Even if a student was traveling across the country, they would still be able to contact their instructors as easily as if they were at home. Taking a course online also opens many doors. There is no limit to how many people can “attend” the same lecture or “maximum room occupancy.” Even as online students have the power of their computers and the internet at their disposal, in person students have access to their peers and instructors whenever they walk into the classroom. Whenever confused about a subject in class, students are constantly surrounded by multitudes of people who can clarify and solidify concepts. Whatever environment students are learning in, the College of Real Estate provides support, offering free One on One and Group Coaching, which are available for graduates to fine tune their skills and ensure that they are fully equipped for their success. Everyone has different levels of proficiency with technology. While taking a course online is simple and easy, many do not feel comfortable enough with computers in order to take an entire course using them. For those who do not have an affinity for technology, the traditional in person classroom is best, allowing students to continue to learn in a familiar way. But taking an online course is not reserved for the tech-savvy. An online course can be a great way for students to practice using unfamiliar technology and exposing them (in a manageable and controlled way) to the new developments in the technological industry. Aside from learning how to master the arts of real estate, online students will develop valuable skills in regards to technology, learning to navigate the internet and how to easily contact/find instructors and information. The College of Real Estate has options for the various levels of proficiency and comfort with technology. Whether you prefer to learn in person or online, the motivation to learn is always the same! Earning a degree in real estate creates a plethora of opportunities. Not only will the College of Real Estate help you achieve a successful career in real estate, but, we encourage our alumni and students to continue learning outside of a classroom environment, constantly adapting and developing their skills. With a knowledge of real estate, the possibilities are endless. Once you earn your licensethere is no limit to what you can do. The College of Real Estate prepares our students to earn their California Bureau of Real Estate Salesperson License and sets them on a path towards a successful and accomplished career.